In Autumn 2013 at our Sunday Morning Gathering, we explored Jesus' teaching as found in the book of Matthew chapter 5 to 7; The "Sermon on the Mount." This is Jesus' manifesto of what 'real' life should be and how His followers should live life in the reality of His Kingdom. Join us as we uncover and seek to put into practice the most challenging words ever spoken. If you follow Jesus, You are different. You think, act and behave differently. If you follow Jesus, You make a difference. Rules: they're everywhere. When we understand the heart of God's vision for us, we can experience freedom. Baptism. From an outside perspective it's sort of weird looking. What is it, and why do we do it? How do you invest your treasure? Could a new perspective on money really change your life? As a follower of Jesus, how do you react to disagreements? Is your life causing people to turn away from God, or towards God? 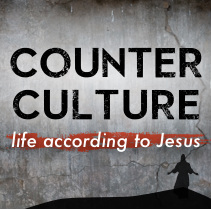 As we begin the two-part conclusion to our Counter Culture series, the big question arises - how should we be affected? Who is the architect in your life, and what are you building your life on? We are better together. We are better people when we do life together. Life is better, richer, more fulfilling when you do life with others. This series also introduces our new Life Groups. For more on Life Groups click here.